Taking a meal to someone is always more affordable when you can share what you're making for your own family. 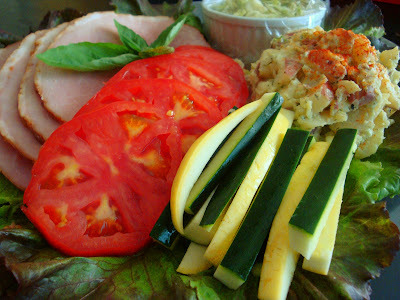 This tray holds baked ham slices, cole slaw, garden tomatoes, zucchini, and red potato salad I jazzed up with our leftover Green Garden Dip. Since it was too hot to turn on the oven, we also sent watermelon chunks and no-bake chocolate fudge cookies. Serving another couple blessed my own family in return: they were delighted by all the "extras" I might not have made just for us! Of course, the Reluctant Entertainer reminds us that you don't have to make a full-course meal to make someone's day. What a wonderful idea! The presentation would make anyone feel special and appreciated! You inspire me! How thoughtful and how special you are to such great hospitality "to go"
This is great! And I love how you displayed it all ~ I'm sure the recipients felt very special! Mmmm!! Looks good! Going back and forth to driver's ed all week with my 15 year old and his friends has left little time for any kind of cooking. Sounds like something I might do tonight! What a nice idea. I always make so much and I need to pass off some to someone who might need it. Meredith that looks wonderful! Shared meals are such a blessing. I was so grateful for all the meals brought to my family last week during my bedrest. Thank you so much for the prayers for my boys! I really appreciate them, and happy to report that both boys looked healthy at our check up this week. How nice! I'd consider myself blessed to see you standing at my door with this. I'm sure the recipients did too. Hey Meredith - that's the way I've always done it. So easy to just DOUBLE UP! Thanks for the linky love today. Oh, and I must way your "presentation" is always knock-dead GORGEOUS. Even when I came to dinner at your house. So very true and such an efficent way of bein good to another. It looks delicious and beautiful I am sure they appreciated it very much. I like to double up our meal when I make a delivery to someone also. If I am making a desert to go to a ladies get-together there is no way the family will let me leave the house without them having some left for them also so I always make a desert to leave for them. Quite a good space but a bit narrow which makes it hard to turn around in. I have a pantry in my laundry room and it never looks really neat. Some of the shelves are a bit high, maybe some more shelves over the water heater. Getting things off the floor is the key sometimes. That is lovely! It looks and sounds delicious.